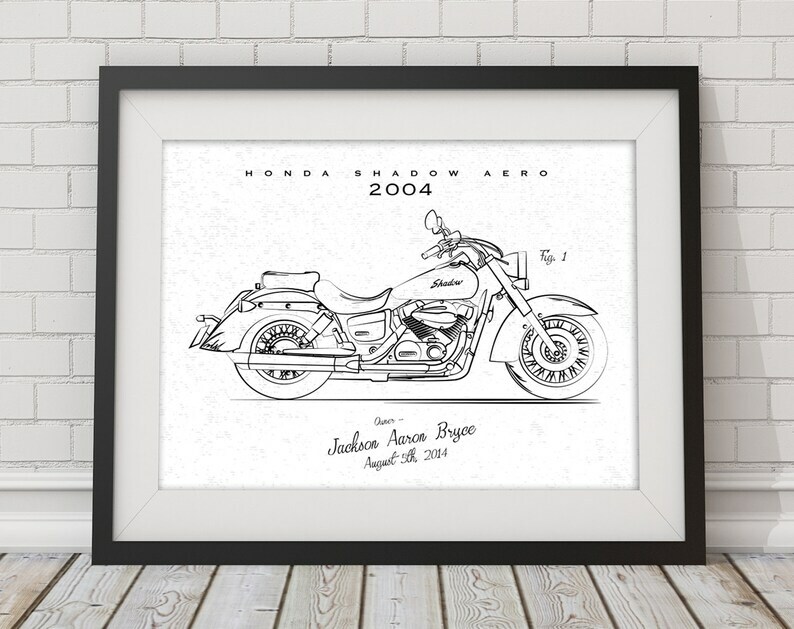 This fully customized sketch makes a great gift for someone who treasures their vehicle. A custom patent-style drawing of your motorcycle or car with a grunge textured background. The top has the name of the vehicle and the bottom has your name and purchase date. Once I receive your order, a PDF proof will be emailed to you in 1-2 weeks. I will work with you until the design is absolutely perfect! Rush options are also available. Please message me prior to purchasing if you are interested in a rush option. Option 1: Printable PDF Only - This digital option can be created at any size. The standard is 11x14". Your final product will be delivered via email as a high resolution print-ready PDF and a JPEG. This option includes free shipping within the US only. Please allow for 3-5 business days for production/shipping after proof is approved. Please indicate size request (for digital file), and your wording. Then, please email the photograph to sameeha [!at] theinkedleaf.com or using Etsy's messaging system. If you would like a colored background or colored ink, please let me know.